I often hear people quoting Gary Chapman’s book on the Five Love Languages. I’ve read his book and I’ve found it useful. Chapman believes that everyone has a love language and that once we’re aware of it, it’s easier to build relationships especially when two people speak different languages. Physical Touch, Words of Affirmation, Quality Time, Gifts and Acts of Service are Chapman’s five categories of love. While he ascertains that each of us has a dominant language, he concedes that it’s likely that we each have a secondary language also. Physical Touch is self explanatory. There are those of us that want a hug and in my home and with my boys, that describes me perfectly. However, it’s my secondary language as I’m dominated by a desire for Words of Affirmation. I love to hear that I’ve done a good job at work or preparing a meal. Those strong positive words that reinforce my value and my being are incredibly welcome and ironically, my dear husband speaks the same language. Quality Time describes those who truly thrive on the time spent with loved ones. My youngest son falls into this category as he still cannot wait for his evening bedtime story and loves to do activities with us. Gifts is the language of my oldest son and the hardest for me as I have no gifting aptitude at all. The word “gift” comes from the Greek word “charis”, which means grace or an undeserved gift. This means that gifts given have nothing to do with an expectation (or a holiday) and are truly meant as a manifestation of love. The Five Love Languages would have me believe that a love for cooking and a love for feeding others is the language known as Acts of Service. It is in many cases but in my case, parenting is just a service-oriented vocation. As we approach Valentine’s Day, often known as the holiday of love, a great meal is part of the celebration and in my kitchen, my love language is roasted cauliflower. 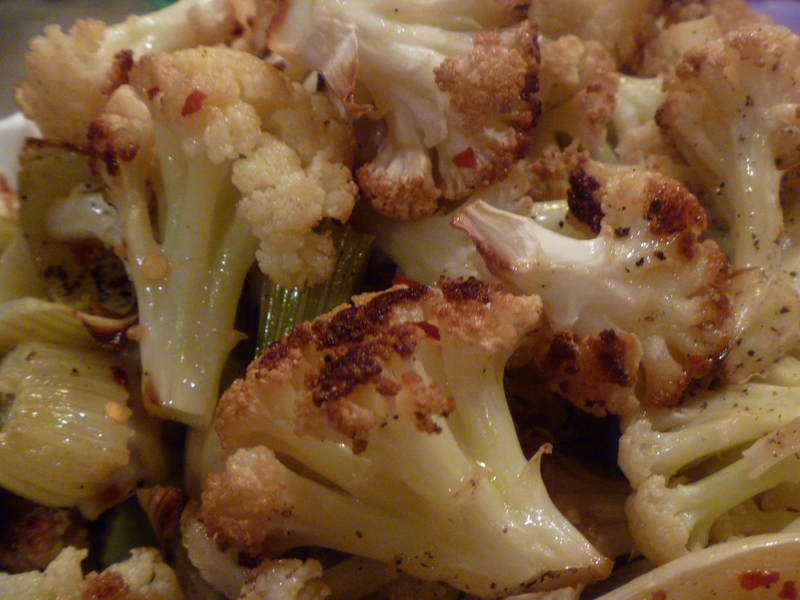 The heavenly taste of roasted cauliflower acts as a physical touch on my being. The compliments about the roasted sweetness are strong, words of affirmation. Sitting around the table, eating together is quality time. My dinner, given that I am not one to purchase gifts, is my present to my family for their enduring love. And finally, yes, this thing called family is an Act of Service. Preheat oven to 400 degrees. 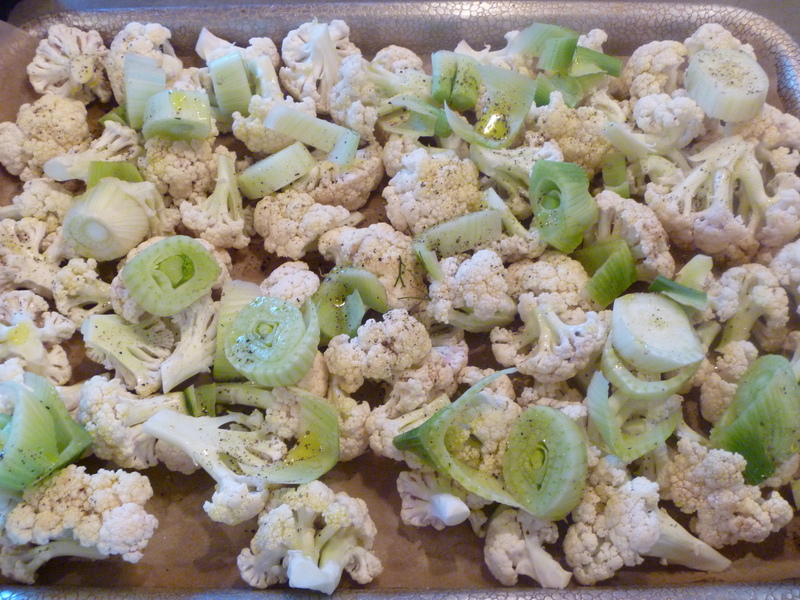 Spread cauliflower and fennel out on a large baking sheet covered with parchment paper. Drizzle olive oil over the vegetables. Add salt and ground pepper. Bake for 15 minutes and then stir well. Bake another 15 minutes. Top with red pepper flakes and serve immediately. Savor with your loved ones. Such a lovely gift to share. Happy Valentines Day, Tammy Dear. Thank you for your gift of knowledge and enthusiasim and sharing wonderful recipes and stories. I buy cauliflower every two weeks. So versatile and healthy. Will try this with fennel and do not forget curry! I roasted so much extra so that we can have soup tomorrow! Actually Indian cauliflower recipes are fantastic. My mom also is a fan of Gary Chapman’s book. I never thought of the Acts of Service as extending to food, but it makes so much sense. Also, your roasted cauliflower looks terrific. I never thought of roasting it with fennel before. What a wonderful idea! And the leftovers make great soup! I love cauliflower! My wife is a wonderful cook, and I consider her cooking to be a gift too! I can think of none better. 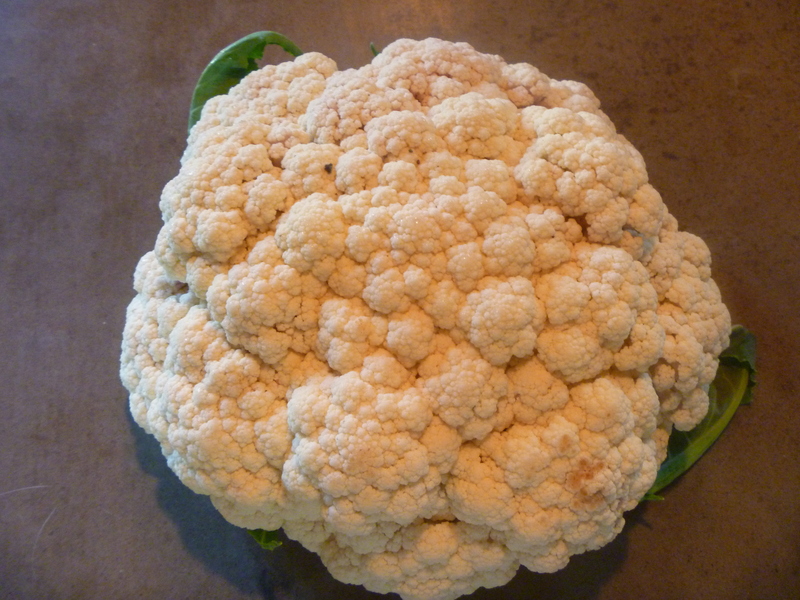 I love cauliflower, don’t like fennel…. so will skip that part. 🙂 I love your article… and your sincerity shines in each word. I have a question, (sincere question) ~ would you just have cauliflower for a meal… or would there be anything else that goes with it? And… anyone who can cook, great tasting food and then serve it so it looks pretty, I believe are love connoisseur. Thanks Tammy! I made bokchoy as a side. The big boys had a steak and the little guy and I ate a piece of cod. Tammy, this looks wonderful. I’m going to ask if my hubby will eat it . .. or should I just fix it and surprise him? hmmmm! I love how you worked this into the love languages. You speak love so well! Thanks Debbie. I hope he likes it. I’ve recently discovered the WOW of roasted cauliflower, and can’t get enough, it’s just a shame my attempts at growing it are so poor! When I grew it, I had to catch it at exactly the right minute. Wow! This recipe looks divine. I just received some cauliflower in my csa box this week (http://inherchucks.com/2012/02/09/whats-in-the-box-13/) and plan on trying it. thanks for the inspiration! You might like the book. normally, i’m not one to find much use in the ‘self-help book’ variety, but this one rings true to me… communication of needs/wants is a tough nut to crack. i tend to need/give ‘acts of service’ and ‘quality time’. although i am no cook! the recipe seems simple enough even for me! thanks for sharing! That’s the deal. We all tend to love the way we like it and the reality is that it isn’t the same for everyone. Happy Valentines day, Mom! I love you! And it was an amazing dinner last night! Happy Valentines Day! By the way your cauliflower was amazing last night! I enjoyed how it had a nice spice to it. I love you! I’m glad you enjoyed that nice spice! I love the extra sweetness and rich flavor of roasted veggies-any roasted veggie. But I have not tried cauliflower yet. It looks delicious. Thank you for the information on Gary Chapman’s book. I have not read it but will now. Winter is my time to read things that are introspective and thought-provoking. It is a Christian book if you’re ok with that but I like his thinking about us speaking different languages. There seems to be some sort of fennel renaissance going on. Another one of my favorite food blogs posted a recipe with fennel too. The recipes both look good, but unfortunately, I’m one of those people who thinks fennel tastes too much like licorice, which I never liked, even as a Pez-addicted kid. I will, however, definitely add the red pepper flakes to my cauliflower. That sounds like a great change from my usual thyme and rosemary. kalamata olives are great also! It never dawned on me that preparing a meal is an act of service. Fantastic post. Sweet wife, nobody has your talent to combine ordinary vegetables with spices and love to come up with the kinds of amazing amazing dishes that you do. Happy Valentines Day! I love you! Love you too! Thanks and I’ll cook veggies for you any time. Yes. Please! That looks SCRUMPTIOUS! LOve it and I missed it earlier. Your BFF and you are just like DH and I – same profiles. I knew you’d love it. Yummalicious!! Thanks for reminding me about the love languages, I was actually trying to describe them to my kids the other day and couldn’t remember them all. I’ll have to try the recipe too. And some words of affirmation for you: You are an amazing woman, not only a talented executive and leader but a thoughtful, sensitive mother! Ahhhhhhhh. Now I feel better. Thank you! Looks delicious and healthy! We have been getting cauliflower in our CSA and I’ve struggled to find ways to use it. I can’t wait to try this recipe. Thanks!!! Give it a shot and if you have left overs, make soup. Lovely words, Tammy. I haven’t read Chapman’s book, but that’s a very interesting take on how to better understand your family members expressions of, and ability to receive, love. Plus you made the cauliflower look delicious 🙂 Happy Valentine’s Day! I don’t think everything can be put into categories but I like Chapman’s book nonetheless. Happy back at you. What a great post. I read that book many years ago. I heard reference to it last week and now again this week. I’ll have a re- look at it. My husband’s love language is ‘quality time’. I had to laugh yesterday, when I went to my favorite home decorating store alone to browse around. After an hour or so, he surprised me when he suddenly peeked around a pillar. I guess he needed his ‘quality time’ tank filled up. 🙂 The dish looks yummy. That cauliflower looks pretty amazing – I just happen to have been given one and was wondering whether to pickle or make soup. Maybe roast first, pickle leftovers?? ooh. I would always roast first but I do like it pickled if it’s spicy. I’ve never enjoyed cauliflower in any dish, but maybe this recipe is just what I needed. Yes, relatively certain that this can push you right over the edge on cauliflower. Tammy speaks 5 languages…loved it! Thank you Jeanne! That’s so sweet. Thanks so much. It was fun to write and fun to cook. Looks delicious! You are so fortunate to get fresh local product now (not to mention being able to “forage” the local citrus trees)! Yes, I have quite a bit of foraging in my own yard that needs to happen THIS week. Wow, so simple and it looks yummy. Baked squash chunks like this are the bomb too — with garlic, of course. Beautiful post, Tammy. Happy Valentine’s Day. I did forget to mention the garlic, didn’t I? Hmmm. My bad. Love squash chunks too. Hope you had a happy day E.
I’ve recently learned about the love languages as well, and I really like the concept. I’ve so often experienced that people miss each other when communicating, and both feel like they give a lot but don’t receive anything back. That’s sad because they actually *do* give, but it’s not understood by the other person. I believe many intimate and family relationships and friendships suffer from a lack of understanding mutual needs. I think so too Kath. I love cauli, and making this would be a gift to myself! BTW, Tammy, I just nominated you for a blogging award on my blog. You’ll see what it’s all about when you get the post. I’m so flattered. Thanks so much Jane. I read that book last year and found it fascinating, especially the stories of the couples that were profiled. We usually think that verbal communication is all there is, but there are so many other ways we communicate love. I think I’m a Words of Affirmation person, followed by Quality Time. Thanks for letting me know! Glad it worked out for you. great combo, I love roasting fennel with veggies adds such a great zing! parenting is just a service-oriented vocation – great line.. Yes, the hardest service I’ve ever performed! Thanks, Tammy—I didn’t know about Chapman’s book. I love cauliflower raw, and cooked all ways, but Isn’t it simply AMAZING what roasting does to it? beyond the beyond good. What & lovely roasted vegetables dish! 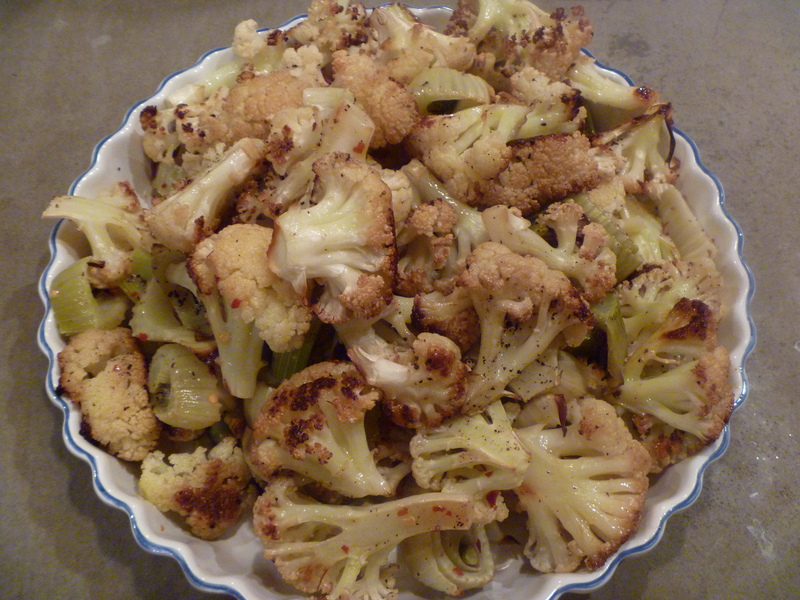 I love cauliflower & fennel a lot but never combined them together & roasting them must add tons of flavour! Do try it Sophie. You will love it! Let me know if you try it. We’ve got a tiny bit left over and now, sadly, I think we’re beyond cauli-season. I’ve read that book and I loved it. Finally I understood myself. My love language is acts of service – such a shame for my husband who doesn’t like to do anything! Maybe he needs to read it! Yeah, that’s all just love! Tammy, thanks so much for your feedback on my posts. And even more thanks for your blog–as a ‘foodie’–is that a love language?–I love seeing these pictures of your roasted cauliflower. Got me planning some upcoming winter meals…Btw, roasting parsnips with a little salt, red and black pepper, and olive oil is also an easy and delicious winter dish. Parsnips are absolutely my other favorite! Great book! I am not a fan of califlower but this one was pretty good!!!! My new speciality is spicy asparagus. BTW: My mom was the best at buying the perfect gift. Even things you never knew you wanted or needed. She was amazing. I sure miss her and wished I had her gift! Spicy asparagus has promise in our house! Yummm I love cauliflower in all it’s many forms!